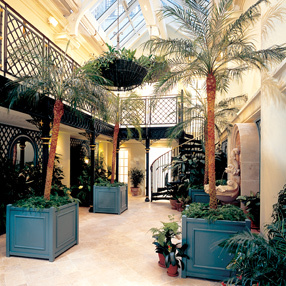 Lloyd Christie Garden Architecture, are based in Richmond, London, with workshops in Oxford and Essex, have designed and manufactured quality conservatories, orangeries, gazebos, arbours, trellises and decking for over 20 years. 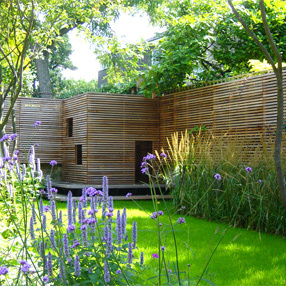 We have set the benchmark for quality of design and attention to detail in bespoke garden architecture in the UK. All designs are carried out at our design offices in Richmond. Our Oxford workshop manufactures our bespoke conservatories, orangeries, verandahs & garden rooms summerhouses gazebos and seating arbours, and our Essex based workshop manufactures our traditional and contemporary trelliswork, pergolas, decking and as well as and our plant containers & obelisks. Lloyd Christie work closely with their clients to ensure that the understanding of the brief meets the users' needs. Our appreciation of different styles of contemporary and traditional architecture enables us to design schemes that reflect and enhance the environment of any project. Whilst garden structures and buildings are our primary focus, we also provide a bespoke design and manufacturing service for doors and windows along with related custom-made joinery. The images show the versatility of Lloyd Christie's products and demonstrate the uniqueness of our exemplary manufacturing processes. With the exception of our standard range of high-quality gazebos and arbours, no scheme is ever replicated, thus our clients benefit from a truly personal service. Whilst the majority of the Lloyd Christie produces are custom-made, we recognize that on occasion a client may be looking for standard sized units. 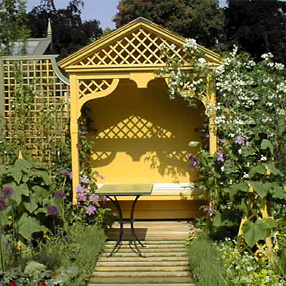 Using the same manufacturing techniques as for our bespoke products, we have developed a standard range of products, including gazebos, arbours, trelliswork, pergolas, plant-containers and decking. These more economical elements can be combined with bespoke adaptations and features to create an individual look. Visit our garden architecture product range page for more details of our custom design and manufacture service.